A great campaign cut short by fate. Ads were created. Music was produced. TV boards were in final approval. 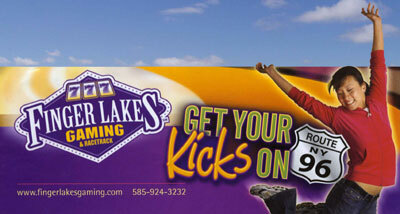 What could be a better theme for a casino located on NY Route 96 than "Get Your Kicks On Route 96"? Client Fingerlakes Gaming & Racetrack was set and ready to go with this campaign and inital ads had already run when fate intervened. An employee of the racetrack was fatally kicked by a racehorse. Running a clever campaign based on "getting kicks" would have created public relations difficulties and the campaign was put on ice for the time being.